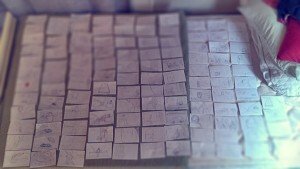 I drew a little over 100 storyboards for this short. I’ve jumped in to the deep end. 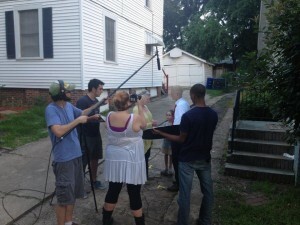 I’m producing/directing/writing/acting “Patience,” a fictional narrative short film based on my experience with cancer. Today is one month from my last chemo treatment, but I’m determined to make this short film. I hope to make the Top 20 of the LA Film Prize, a film festival unlike any other in the world, and have it premiere here in Shreveport, LA. Rouch cut is due July 9th, I only have 3 weeks left, but I have storyboarded the entire film so I know every shot I need to get so I don’t waste any time. Now I just need to get it. I pulled a few strings and was lucky to film the first scene with Veronica Cartwright. It was a great experience but intimidating to write words for, act with, and direct someone who has worked with directors from Hitchcock to Ridley Scott. I learned so much from her and that scene. She was a great help to me in navigating this unfamiliar territory that she has traveled so many times. When I went through chemo I was watching many film’s behind-the-scenes footage and I’m trying to collect some from this short to share. Let me know if there’s something specific you want to know about the production. I hope to post updates as production progresses. Subscribe with your email address to my website in the top right corner of the sidebar to get automatic updates. Filming a take with Veronica. Lucas, I’ve been following your posts for a few months now and I have really enjoyed seeing the amazing scope of work you are involved in. I can imagine you must spend all your available time between Moonbot and your personal projects. I spent 15 years working as a CG animator from 1986 to 2001 (old school compared to what is going on these days) and I know what kind of energy it takes to do all the stuff you are involved in. I look forward to seeing what you come up with for “Patience.” All the best to your future health and creativity. It must be fascinating as an animator to compare one process to the other – glad to hear that you’ve gotten a chance to explore the art of live action! The process of filmmaking is grueling so I hope you are keeping some energy on reserve. I wish you luck, energy and strength!